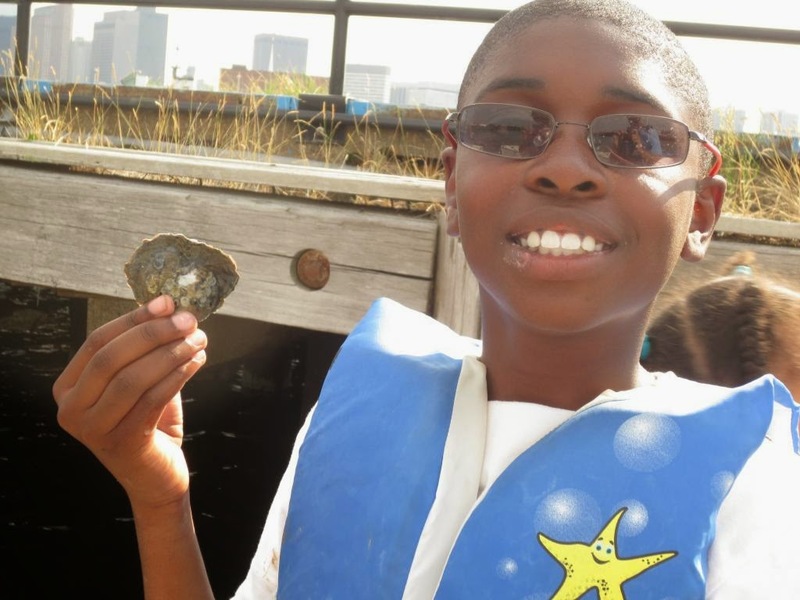 There were many creatures pulled up in the traps at Courageous Sailing Center today, one of which was an oyster! While they are not very visually appealing, these bivalves have a strange yet valuable talent. When an irritant such as a grain of sand becomes trapped inside the oyster's shell, it's body surrounds the grain in nacre, a substance the oyster naturally produces to create its hardened shell. Over a long period of time, this nacre builds up until finally, a beautiful pearl is produced! Why is this relevant? 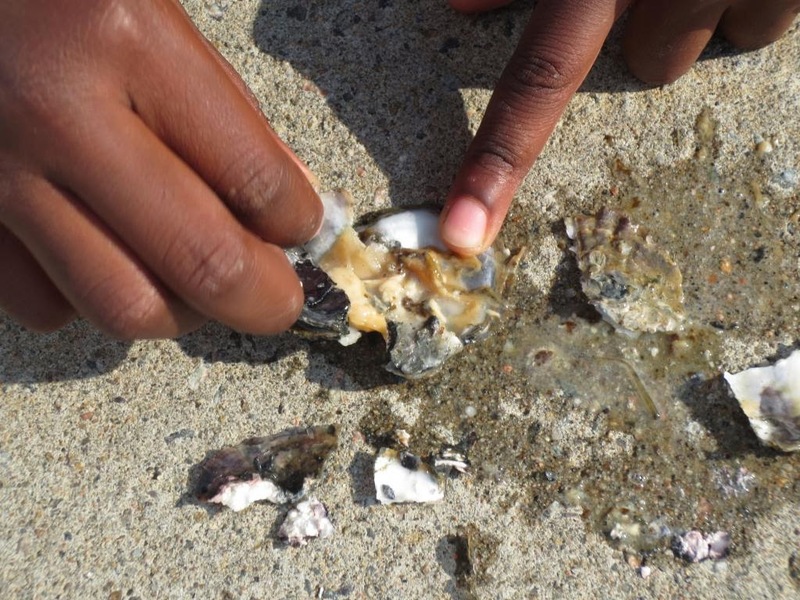 Well for this young explorer, his first thought when he saw the oyster was, "do you think there's a pearl in there?" As soon as he let out that question with such excitement, all the other kids became pearl-envious and wanted to crack open the oyster's hard shell. With money-filled ideas swirling in their heads, the kids shared dreams of everything from buying a new iPad to a car. At this point, the excitement reached a maximum, and their patience had run out, to which the oyster was cracked open. To much disappointment, there was no pearl waiting to be found inside the oyster. Although they did not find what they were looking for, I discovered just how easily their imaginations could run wild with even the slightest possibility of finding a pearl in an oyster. Who knows, maybe next time we really will find a pearl. 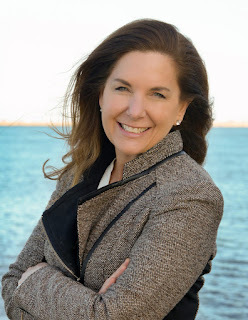 Today at McDonough Sailing Center I got to do something very exciting- sail! 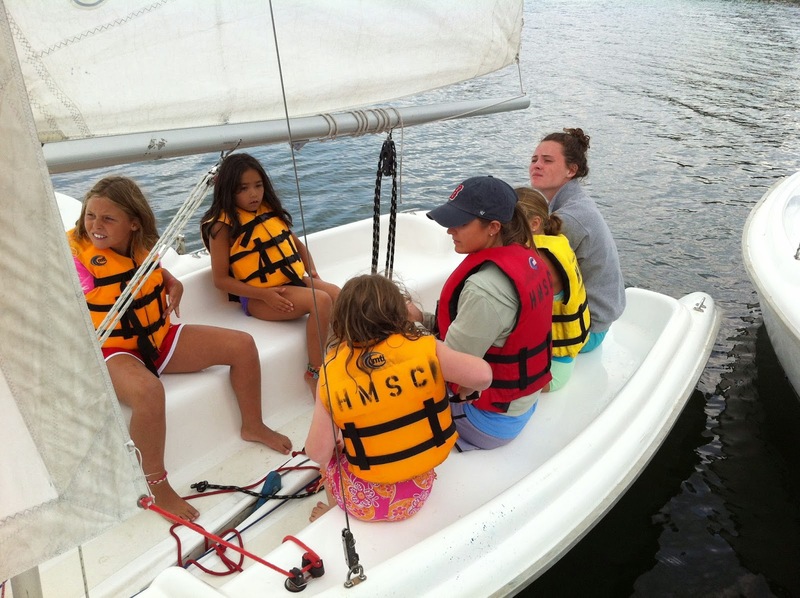 I went out with some of my favorite campers- Mae, Lauren, Chloe, and Allie- and their favorite sailing instructor, Katie! 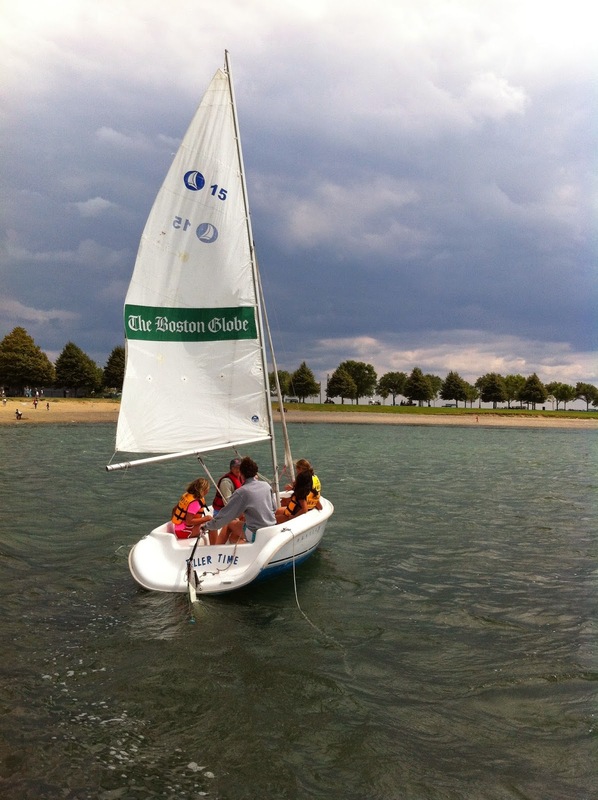 I took sailing lessons as a child in Connecticut, but I remember always being extremely nervous on the small Optis we learned on. I even remember crying some days before camp because I was too afraid to go! Ever since then, I have never been fully comfortable on a sailboat- the keeling over feels very unnatural to me, and my instinct is usually to jump off if it keels over too far! 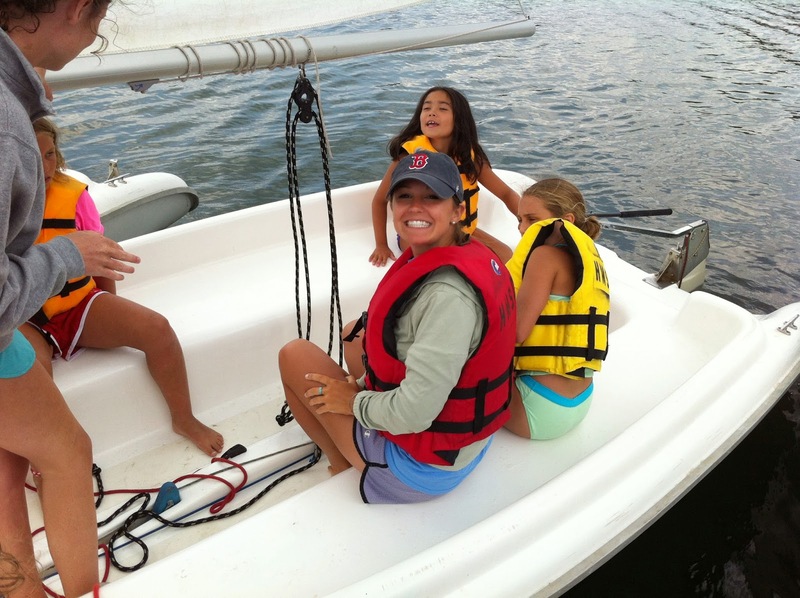 However, I absolutely love water activities and all other kinds of boating, so I decided I would use my time at the McDonough Sailing Center this summer to conquer my fear. After about a month of thinking about it, I finally asked the girls if they thought it would be okay for me to join them on their next sailing lesson. It was an overwhelming 'yes'- they were all really excited to bring me on board and show me their knot tying and tacking skills! Mae, Lauren, Chloe, Allie, Katie, and I about to push off! I was nervous at first, but the girls assured me that it would be a lot of fun, and that we wouldn't capsize- so I strapped on my lifejacket and climbed into the boat. It was an exciting feeling to become reacquainted with a sailboat- I realized it's like riding a bike, even after all these years I still remember exactly what to do with the tiller, mainsheet, centerboard, and jib! While I wasn't allowed to sail the boat today since it was pretty windy, I'm hoping that by the end of the summer I will get another chance to get out on the water and test out my skills! 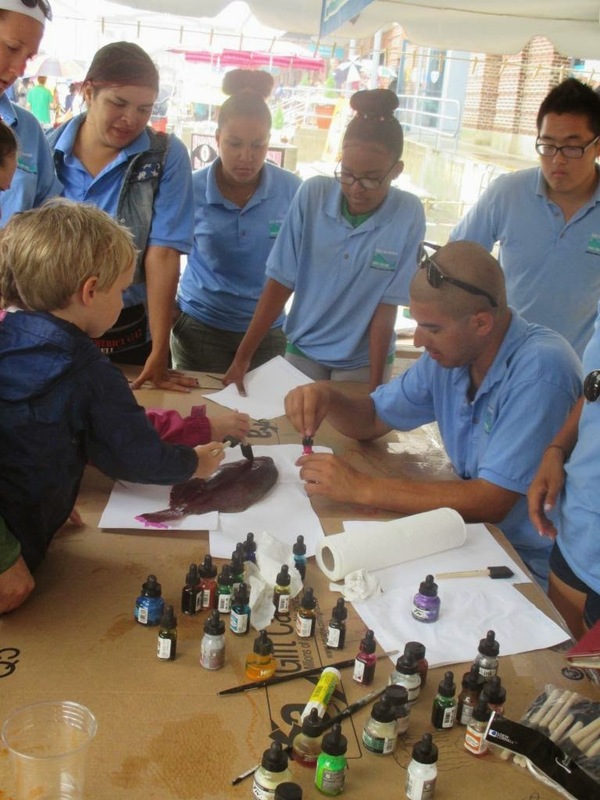 I usually spend my Sundays with my family but this past Sunday I was working at the Fish Pier doing fish prints with kids and representing Save The Harbor. The day started of well, it was a warm sunny sunday then things took a turn and it started raining and it wasn't a pleasant place to be. The people who were at the Fish Pier we're awesome enough to not leave and they waited the rain out. 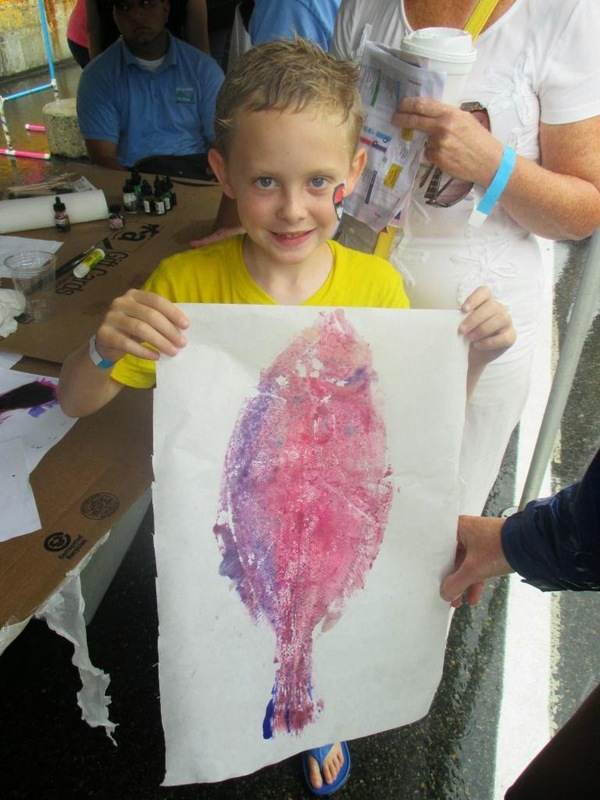 When it was pouring we had an opportunity to learn how to use paper and paint to make fish prints. In the beginning I felt like it was going to be complicated but Sam helped me out and after I gained some confidence I felt like a pro. After I learned how to make the fish prints, I had the opportunity to help many little children and a few adults learn how to do it. All the kids that made their fish prints, depending on the color and the fish they chose, came out beautiful. My favorite fish that we worked with was a Fluke, the Fluke was really flat and it made it really easy to print. The Fluke was one of the most popular fishes that the kids chose because we were using the colors Pink and Purple and the kids loved it because they were really colorful. I never expected to have as much fun as I did working on a sunday. This week at Piers Park I had the chance to be part of what I think was a really important part of a young child's life. I had been working with a boy named Alex for the past two weeks and he has never touched a crab, so this week I made it my mission to show Alex that crabs are not harmful if you hold them the right way. After we had caught a few crabs there was one that had no claws and I thought, "that's going to be the first crab that Alex will hold!" After a few seconds of playing with the crab and showing him that it was harmless, Alex worked up the courage and he held the crab all by himself. I think I was more excited then he was to see him holding his first crab. Since then Alex is now able to hold the little crabs with ease, and he is slowly getting more comfortable holding the bigger crabs- I'm fine with that because Rome wasn't built in a day! 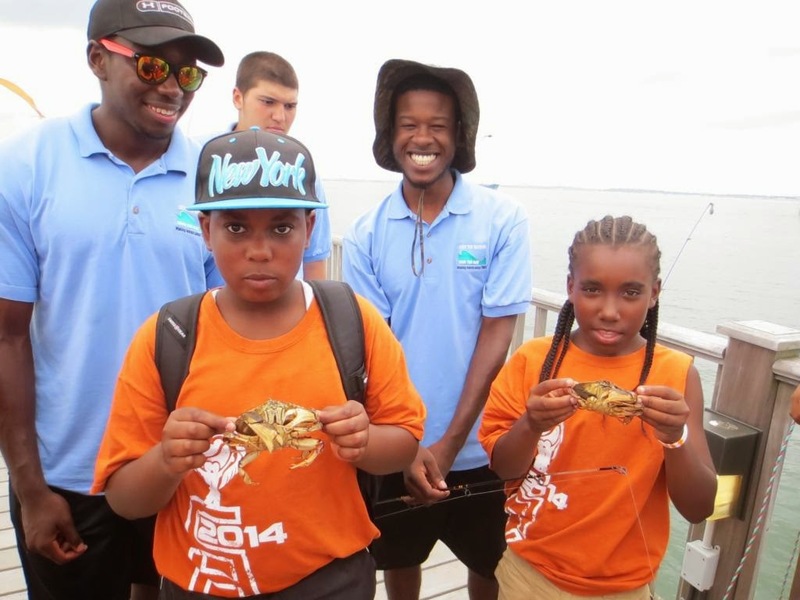 McDonough has been really amazing this week because most of the kids that never touch the fishing rods or the crab trap are all now active and involved. 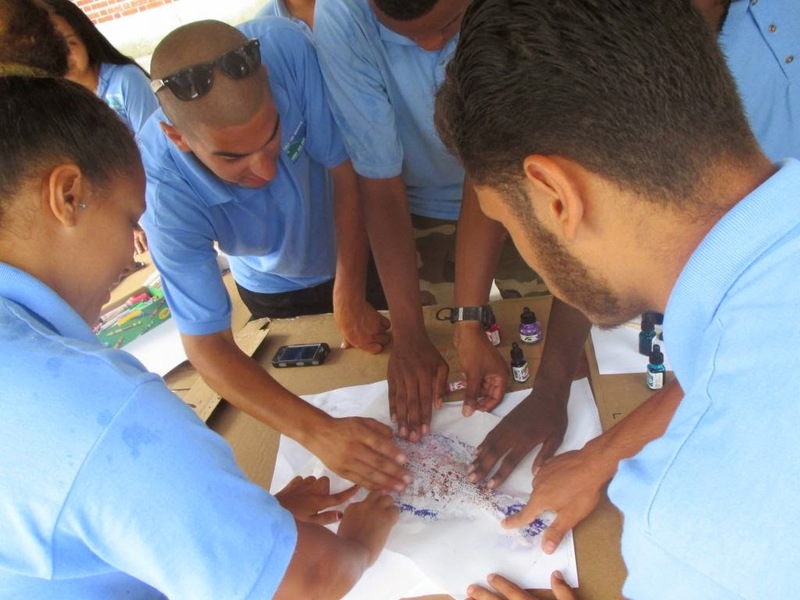 I really love it when I see all the new kids working together and doing something for the first time. Before they try fishing or crabbing they say it's difficult but once they start there's no stopping them. This week we have been fortunate enough to catch lobsters. 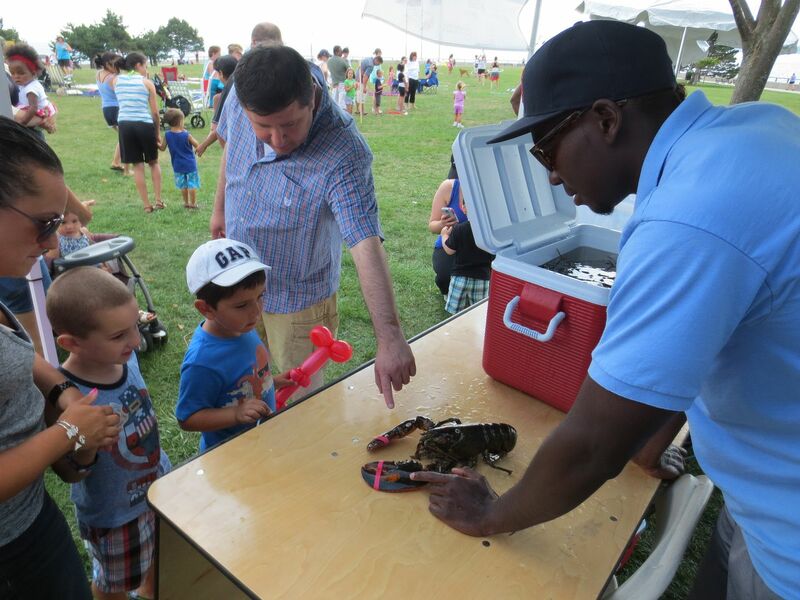 This attracts even more kids because most of them have never held a lobster before and when they do they are always ecstatic and can't hold their excitement in! Early Sunday morning many of Save the Harbor's staff congregated on the Boston Fish Pier to celebrate the annual Seafood Festival. It was an invigorating sight to see the normally quiet Fish Pier transform into a bustling and energetic attraction for all to enjoy. I have never seen so many people on the pier at once. An area that is normally devoid of any people suddenly had hundreds of people, as well as tents from various organizations. 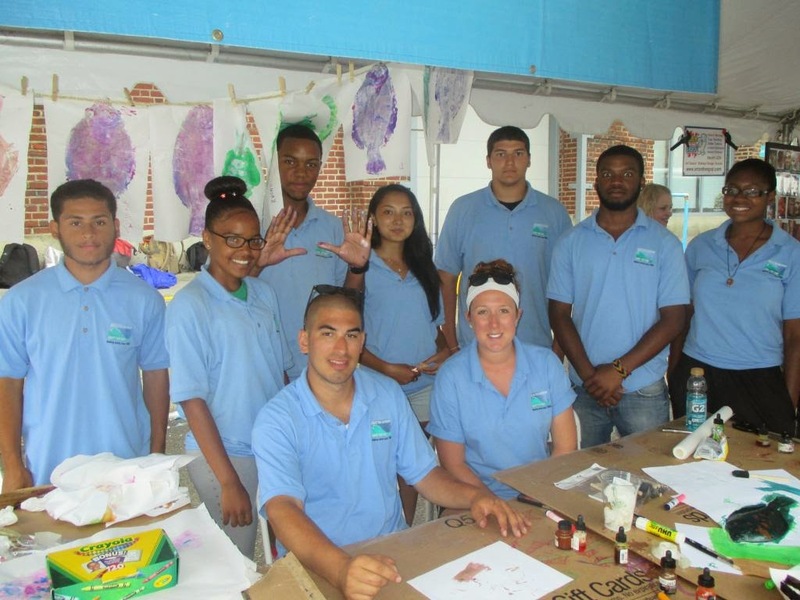 The Save the Harbor team worked on fish printing the entire event. 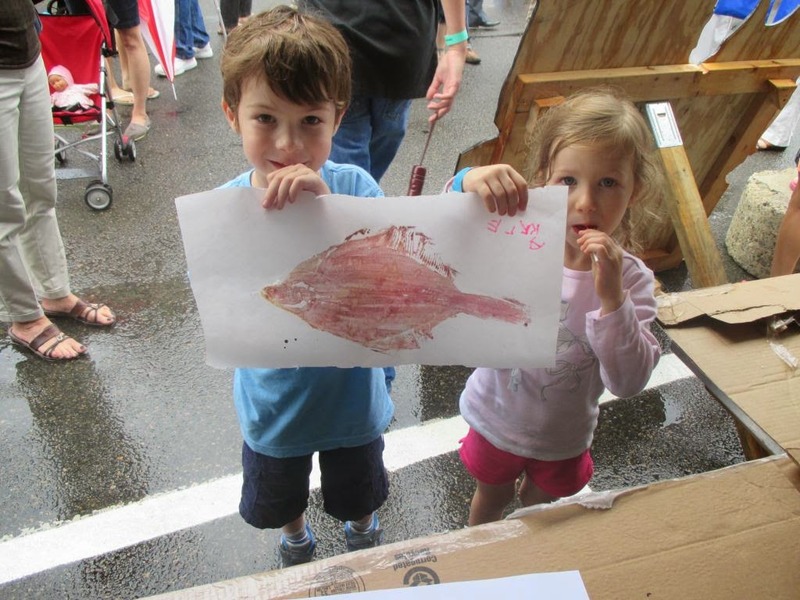 Fish printing is relatively easy; all it requires is a fish and some colored ink. First, the fish needs to be placed on some sheets of paper so the ink doesn't run through. Next, the entire side of the fish needs to be brushed with colored ink. The last step is to place a sheet of paper on top and let the ink show through. Before the event even began, the weather didn't look too good. 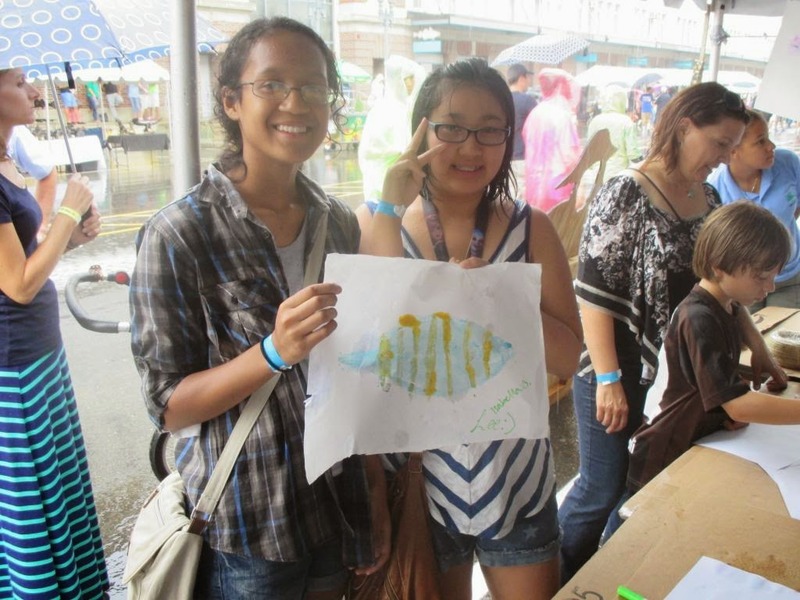 The entire event was rained on, but that didn't stop passerby's from stopping at our tent to make fish prints! The fact that people still came despite the relentless downpour is a testament to how interactive and amazing the event was! The rain didn't impede on the overall enthusiasm and excitement of the event whatsoever. I hope to attend more events like this in the future! Besides fish, the most common sea critter that we catch on every single Save the Harbor site is... you guessed it: crabs. At any given time on any given site crabs are caught regularly. At Piers Park Sailing Center crabs are literally all we catch. 90% of the time we catch European green crabs, which are an invasive species from Europe. The green crabs can be easily identified by the five spikes next to their eyes. Green crabs can be somewhat deceiving because not all of them are green, they can even be orange. 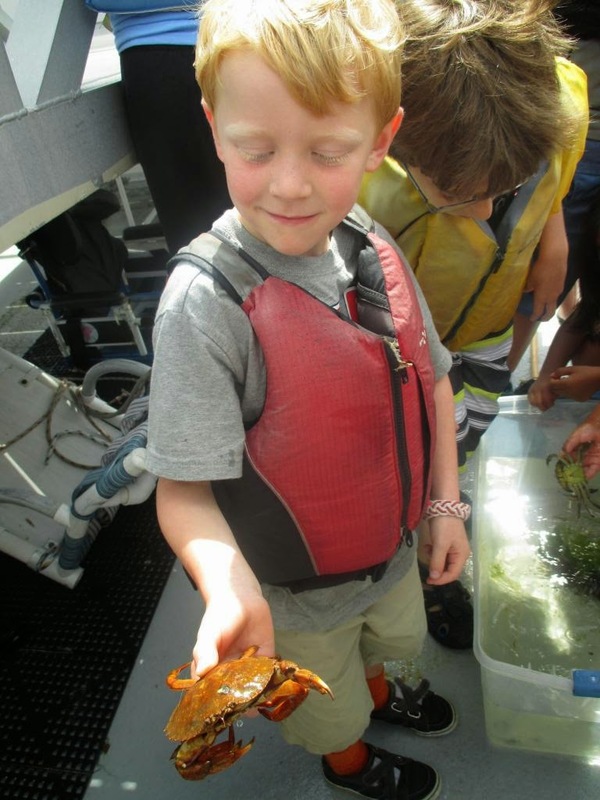 We teach the children that they are invasive species, and are a huge threat to the survival of the native rock crab. This plays a huge role in the event that we need to sacrifice a green crab for bait when bait is scarce. 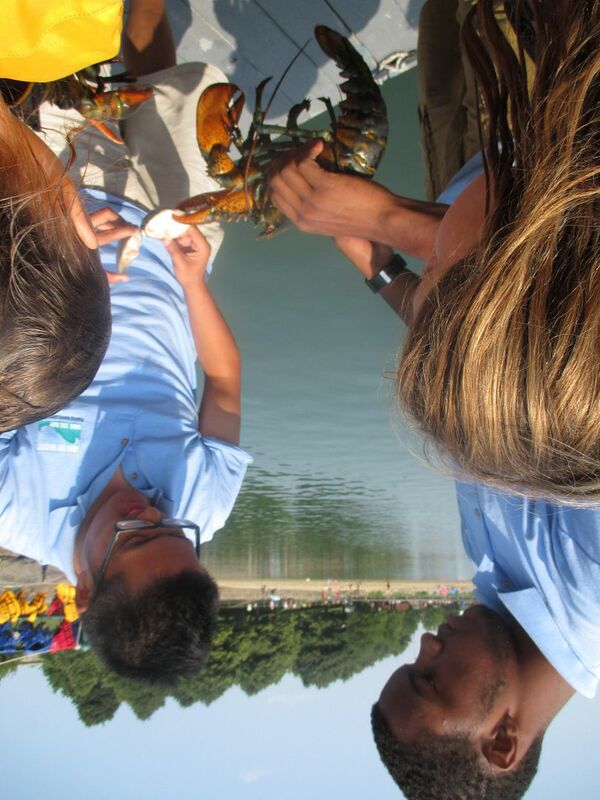 The kids at Piers Park are always enthusiastic about catching crabs. They constantly ask every minute or so to pull up the crab trap. They are always eager to see if there are any crabs in the trap. The children almost always want to be the ones to throw the crab trap back into the water. It is always a pleasure to see that the children are excited time and time again to catch crabs. They are always especially excited to race the crabs into the water at the end of the day! 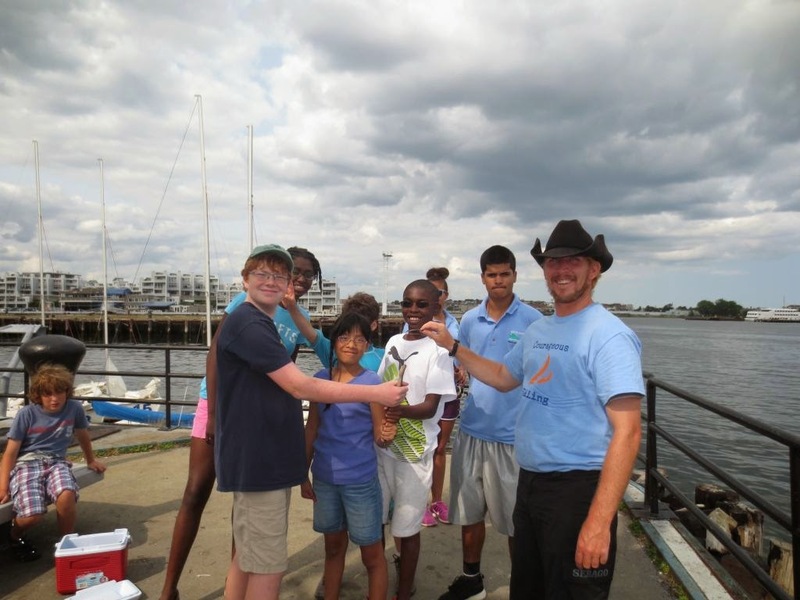 All Access Boston Harbor took 10 youth and community groups out to Peddocks Island on Thursday. 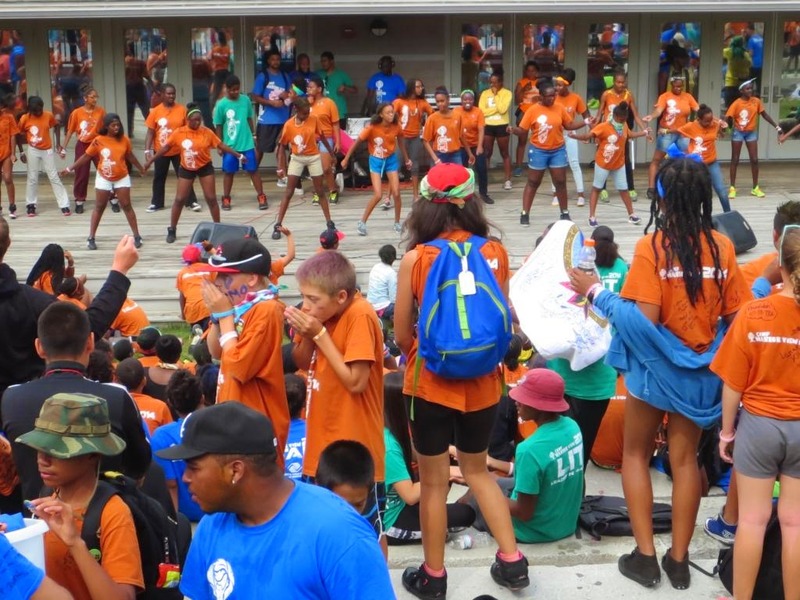 The youth had a wonderful time swimming, playing intense games of kickball and doublebounce, fishing and crabbing, and engaging in a variety of healthy outdoor activities. However today was no ordinary AABH trip, as a special guest joined them: Governor Deval Patrick! Anthony, Isabelle, and Jennifer from the Jackson Mann Center for Youth and Families from Allston examine their specimens. The Governor was on the Island for the Department of Conservation and Recreation’s Peddocks Island Improvements Celebration, along with the DCR Commissioner Jack Murray, the Secretary for Energy and Environmental Affairs Maeve Callely Bartlett, the Northeast Region Director for the National Park Service Michael Cardwell, and the President and CEO of BHIA Phillip Griffiths. Nazie from the Idil Learning Center poses before engaging in a fun game of Frisbee. Governor Patrick spoke highly of the developments taking place on the Boston Harbor Islands, and how it “takes partnerships to make a treasure like this come to life.” He expressed a desire to make the recreational and educational opportunities offered by the Boston Harbor Islands better known and accessible to people, as they are, in his words, “public treasures meant to be used by the public.” Save the Harbor/Save the Bay’s role in this initiative was recognized by the DCR Commissioner Jack Murray: “Save the Harbor/Save the Bay brought 482 kids out today to enjoy the Islands.” The Governor then cut the ribbon on the newly finished Chapel, assisted by Chase, an AABH youth from Dorchester. As it was the Governor’s birthday, Senior Marine Educator Sam presented the Governor with a fish print created by a past AABH youth, using a flounder caught in the clear clean waters of the Boston Harbor. After thanking the Governor for his continued interest and investment in the Boston Harbor and Islands, the STH/STB staff posed for a picture with the governor, before continuing to enjoy a day of fun with Boston area youth. So mostly everyone got switched to different sites and I was moved to Community Boating and Courageous Sailing Center. It is very different from what I have been doing at Piers Park and McDonough but it's ok. At Community Boating I have already caught twelve fish in the past two days which is pretty awesome. I don't even have to use a fishing pole to catch fish there. I just put some corn on a hook on a short piece of line and leave it in the water for a few minutes and BAM I catch a little sunfish. It's so different from Piers Park because there are many more kids at Piers than Community Boating and all that is caught for the most part are little green crabs. So I like that I have finally caught something this summer and it was really exciting for me. 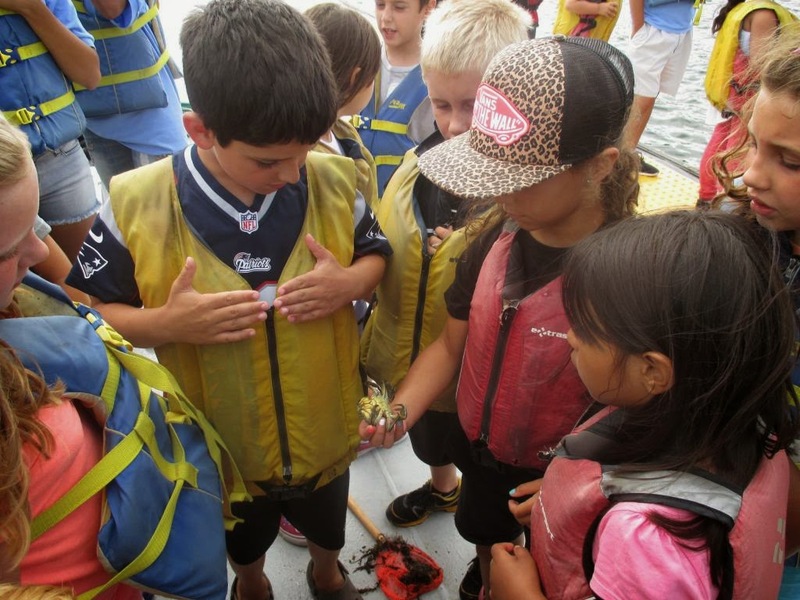 At Courageous there are more kids then at Community Boating that get super excited when they see fish and go down to the dock to see what got caught in the traps. Also some get a bit too excited when we offer the idea of killing a crab for bait. At McDonough not too many kids want to kill the crabs for bait, same at Piers Park. They always question why we do it and some say that its mean and all this other stuff. Working at these two locations is definitely another new experience and very different from what I was used to doing since the beginning of the summer but so far it's ok. I am definitely looking forward to working at these two sites and am hoping for many stories that I can tell others just like I had many stories to tell when I was at my other two sites. In Save the Harbor / Save the Bay we were at Community Boating. 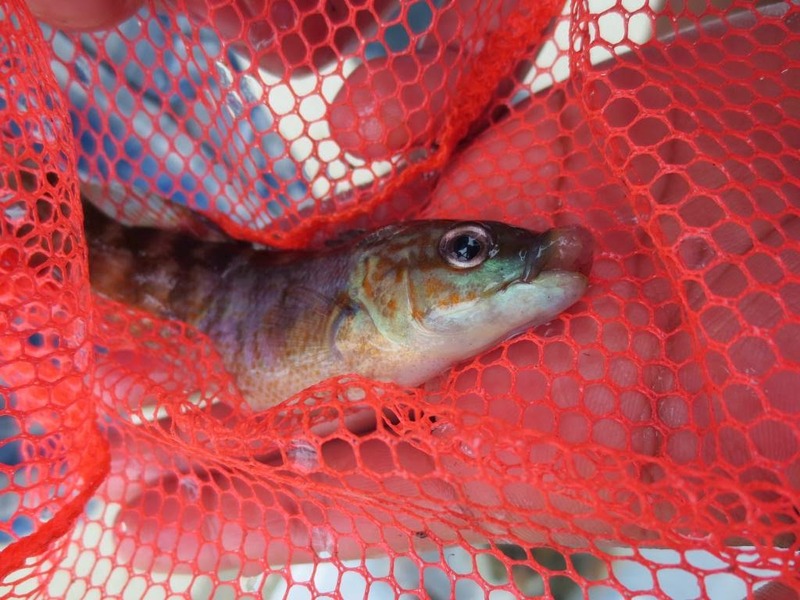 the group and me caught an black eel with two small perch, which we put in the touch tank to use it as bait. At Charles river you are able to go on small boats. Also go down and fish on the deck. Also the fish that we've caught is different from the fish that my other group caught in the Children Museum. Next the group and me start heading to Courageous were there we caught a lot of green crabs with three cool sea star. As I put the sea star onto my skin you can feel the sea star tiny legs attaching to your skin. At the site that I was at today the children seemed like they were enjoying fishing and touching the animals. As bait we were using corn, bread and fish to try and catch anything that's in the harbor ocean. The children seem more interested in the eel and the sea star and a baby green crab that we had in the touch tank. Hello again fellow adventurers! Fishing at Courageous Sailing Center has been nothing but uneventful the past few weeks, but that doesn't mean that we're not having fun trying! Day in and day out, the kids and staff at Courageous are all smiles as they get the chance to experience things they have never seen before. 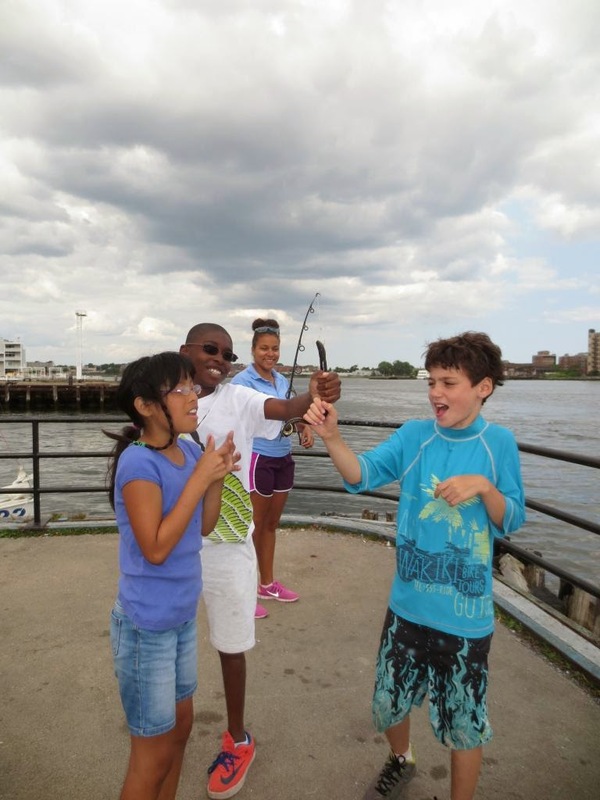 I think we were all a little surprised at just how excited these kids were to even just cast the rods over the side of the pier in hopes of reeling in a monster catch. So far we have tried just about every bait you could think of, from crabs to clams and even hot dogs. But perhaps the strangest and most interesting bait we have used so far is eels. Taken from the Charles river, these slimy American eels provide ample entertainment for those slow fishing days at Courageous. The kids thoroughly enjoy getting a chance to try and hold the eels, as they eventually wriggle their way out of everyone's grasp; then it's a screaming calamity as it slithers along the pier, with kids laughing and trying to stay clear of its unpredictable path. Once we finally get them on the hooks, there's a fight for who gets to toss the line over the side and fish with the eel. While it looks bleak right now, I believe that our fishing luck will soon turn at Courageous. This past week we have caught more fish than we can count at Community Boating, something that seemed too good to be true a week ago. Therefore, I think it's only a matter of time before we get that big break we've been waiting for. This week is my first week to work at Boston Children's Museum. I am having a lot of fun with the kids. Also we caught green crabs and a spider crab. I never seen spider crab before but this week at Boston Children's Museum I had a chance to see spider crab. Also I learned how to hold the spider crab and show the kids. It is fun spending my time with the kids because it makes me really happy. Some kids are really brave to hold and to touch the crabs but some of the kids are very scared. the kids are holding the crab and trying to picked up using the net! All the kids likes to fish. Also all the kids want to learn how to fish and they like to learn about the crabs. It is the best thing to spent time with kids this makes me happy because I have younger brother and I like to play with him. Kids love to ask a question because they like to learn and to know every thing. no one dared to stand up to the challenge of group did their verse ..
experience. I wanted to sing with her and follow in her foot steps . , and I appreciate her courage a lot more than she may ever realize . This week was sadly my last week with the first group of kids at Camp Harbor View. It was pretty sad to realize that the children I had become so accustomed to seeing everyday at fish in club were no longer going to be there anymore. No more crab catching and fishing and occasional skate catches. I was no longer going to talk with Niya about Lacrosse and I was no longer to see Kendrick and listen to all of his rap jokes. But I did realize the one positive and that is that these guys are growing up and we had a chance to have an impact on their life, which I consider to be a positive one. Towards the end of Thursday, which was our last day together, they had a talent show, which showcased all of the kid’s talents, which included singing, dancing and even some poetry. I was proud to see some of the more shy children go up and still perform in front of such of a large group of people. I remember when I was their age, and I know I didn’t have that sort of courage. 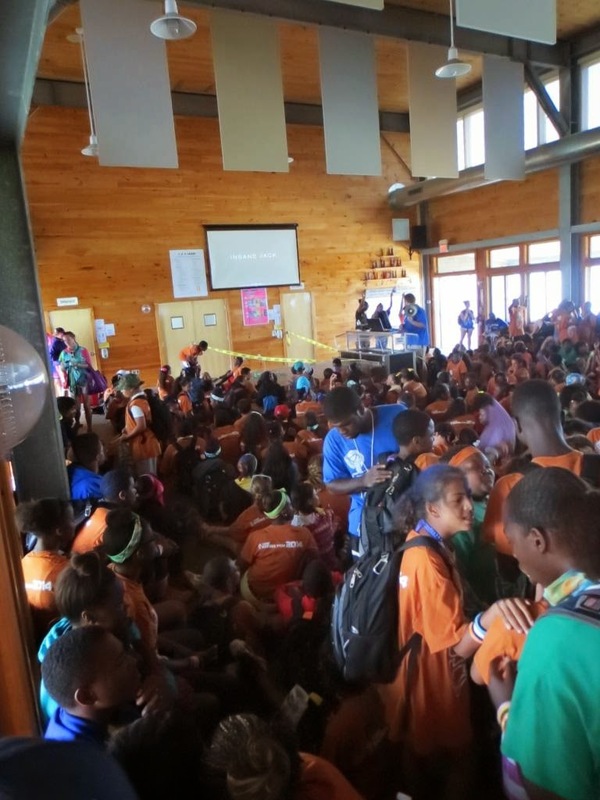 Camp harbor view even made a slideshow of all of the children and all of the events and great memories they had shared over the past four weeks together. Some of the girls began to cry and hug each other realizing that this was it, but as sad as it was, it was beautiful to know they had made friendships which will last them a lifetime. Today at the Children's Museum, the people from the New England Aquarium brought a penguin to put on display. The penguin's name was "Roast Beef". It was a big African penguin, and it attracted a lot of visitors at the Children's Museum. I got take a picture of the penguin. Roast Beef and I had a lot in common, because we are both from similar places. We also caught a lot of crabs and little choggies. The first day we tried to fish didn't really go well, because we used bread as bait. Today, we used squid, quahogs, and mackerel as bait, and it was much better. The fish and crabs liked to eat the bait we used. By lunch time, we caught 12 green crabs, 4 spider crabs, and 4 choggies. With the bait that we used, we even caught a big eel. I wonder what we'll catch tomorrow. Once again it seems as though the lobster traps at Courageous Sailing Center have provided something out of the ordinary. This time it seems as though we have caught a mouth-brooder! Mouth-brooding fish incubate the eggs of their young in their mouths to ensure that the majority of the offspring survive to hatch. While this behavior is rare among North-American fish species, it is possible that this fish is not native to North America. In the summertime, the currents bring warm, topical water up the coast and typically bring with them some very out-of-place organisms. This is also the reason almost every summer there is a great white sighting off the cape. More research needs to be done before we can confirm that this was in-fact a mouth-brooder. 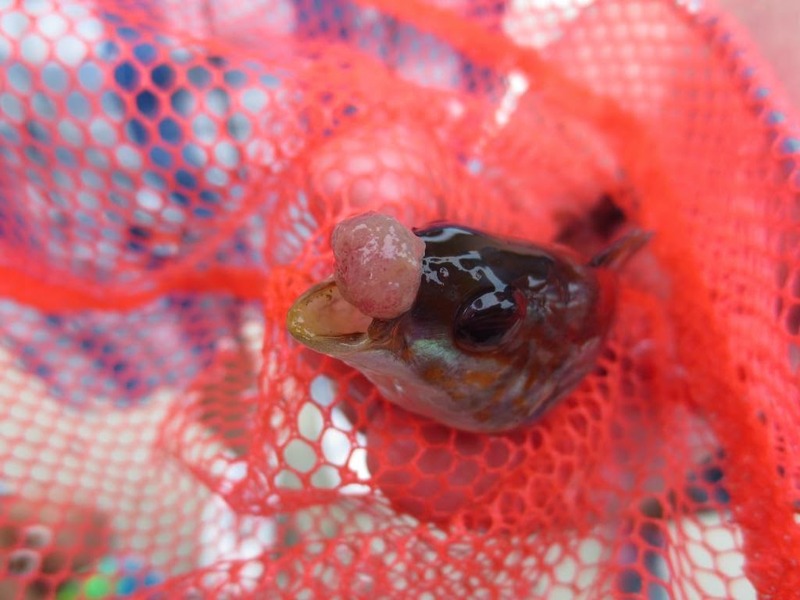 The fleshy mass found on the mouth of this fish could possibly be a reaction to an infection of some kind that the fish was exposed to. This could have come from something as simple as a scratch sustained from the side of the lobster trap it was captured in, as it was in a deteriorating condition. Also, we have yet to identify the species of this fish. Once we do this, we will know if that species is typically a mouth brooder. For now, we can only hypothesize. On Saturday, Tom, Maxwell, and I went to the Friends of Lynn and Nahant Beach Children's Concert at Red Rock Park. It was a really fun way to spend part of my Saturday. 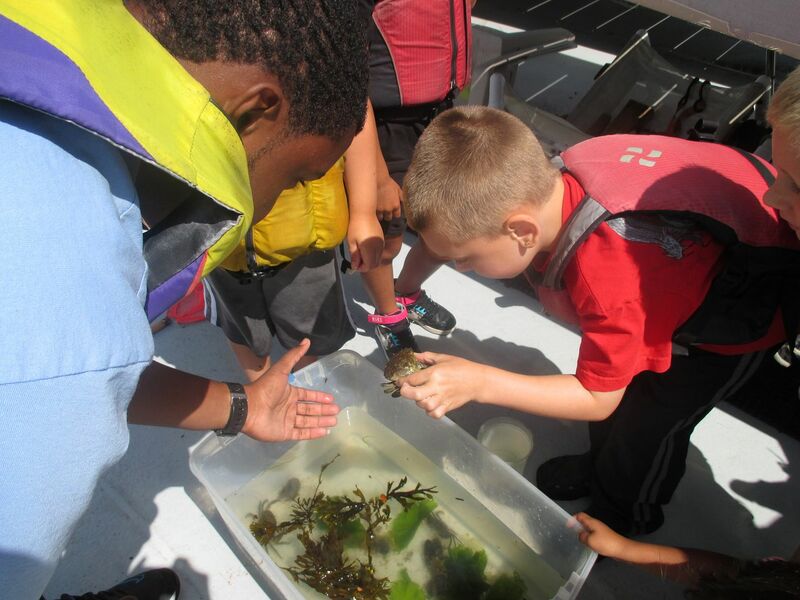 We had three monster-sized lobsters that we trapped in the harbor, so to get more animals for the younger kids to hold and learn about we went tide-pooling! 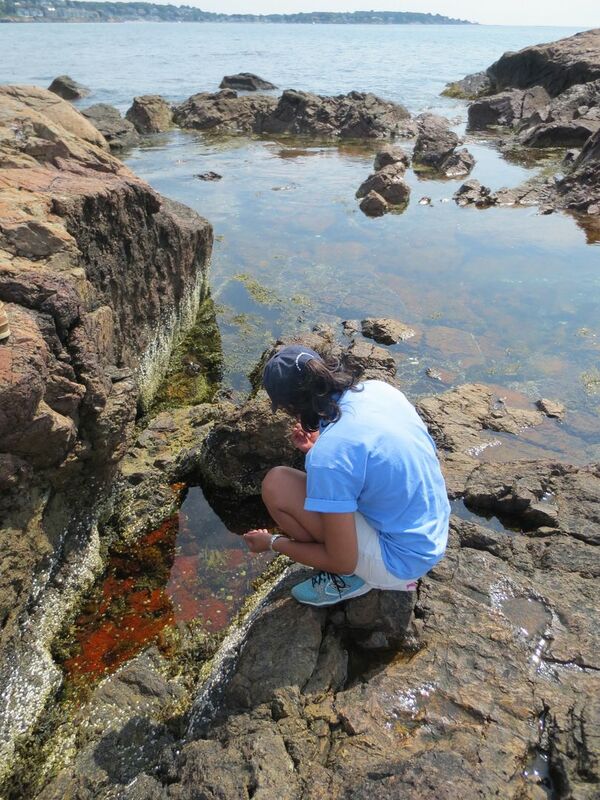 Right at Red Rock Park we got about 20 hermit crabs, a handful or periwinkles, 2 green crabs, and seaweed aplenty. 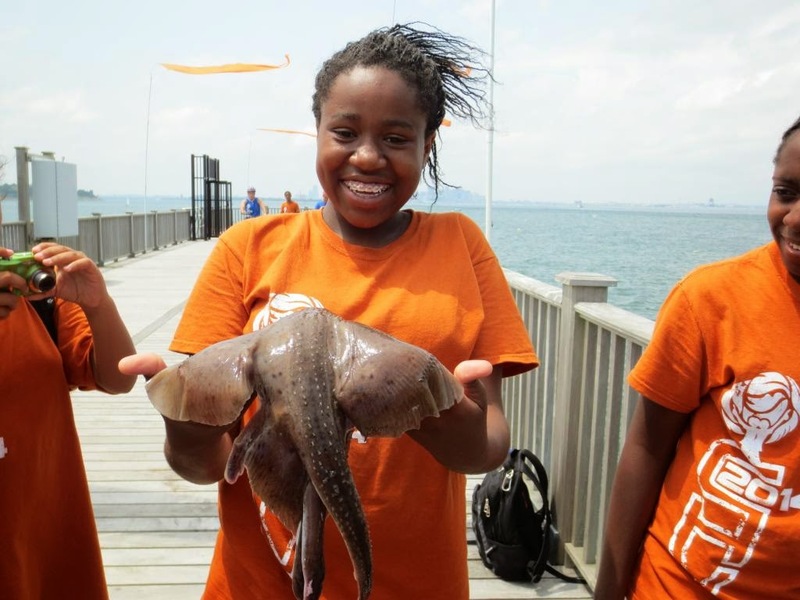 We talked to tons of kids and their parents about the creatures we had, about the beach and the harbor, and how much fun they were having at this awesome event. There was face-painting, balloon animals, a really funny kids band called Toe Jam Puppet Band, and to top it off, it was a beautiful day. 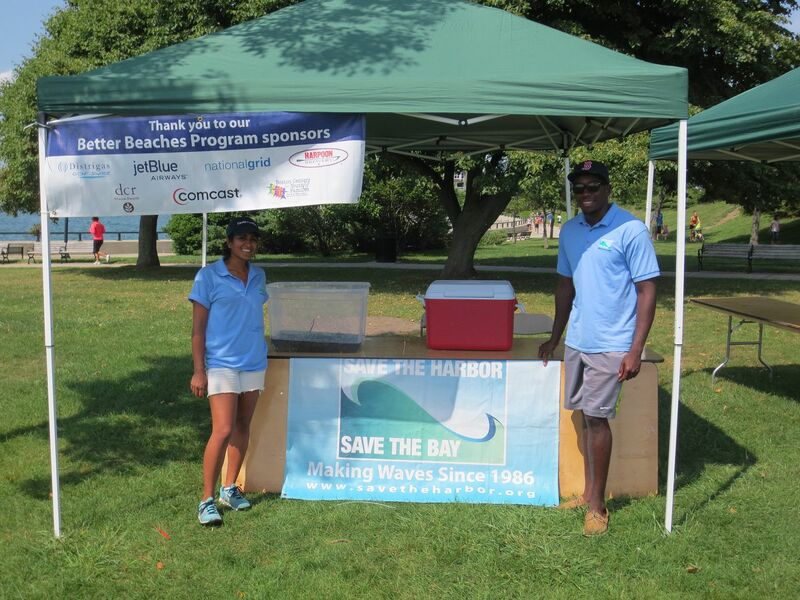 The event was very well organized and everyone, including the Save the Harbor staff had a great time! Finally, at one of our sites, we have consistently and successfully caught fish. The sweet spot, as it turns out, is a public dock near Community Boating. Just tossing in a line with a kernel of corn in the water will usually hook you a fish in a matter of minutes! Patience is still important as it always is with fishing. Some of our explorers have yet to learn this. But when they do, they will definitely be able to hook some fish. Happy camper with her sunfish! The sunfish like to hang out right under the dock so we've been using our underwater camera to see them. We can often see about 4 or 5 at a time just waiting to steal our bait. It's so cool that we can show kids that with the right bait and attitude they can catch a fish. The sunfish are only about 6 inches long- not quite worth bringing home for dinner. Unfortunately, the little sunfishy mouths and our tiny, barbed hooks are sometimes not the best together, and we have to finagle the hooks out of the fish. When we get a fish that's hooked badly, we all assemble as a (very unqualified) surgical team. Luckily, we have a very high success rate! Now that we've found the best way to catch so many fish that we don't even know what to do with them all, I can't wait to see what else we can try and catch. Hopefully we will catch a carp or a catfish soon! On Sunday, Save the Harbor/Save the Bay attended the 3rd Annual Seafood Festival celebrating 100 years of food, culture, and economy on the Boston Fish Pier. When I arrived, it was raining. But the rain didn't dampen the festivities that ran underneath big white tents along the pier. 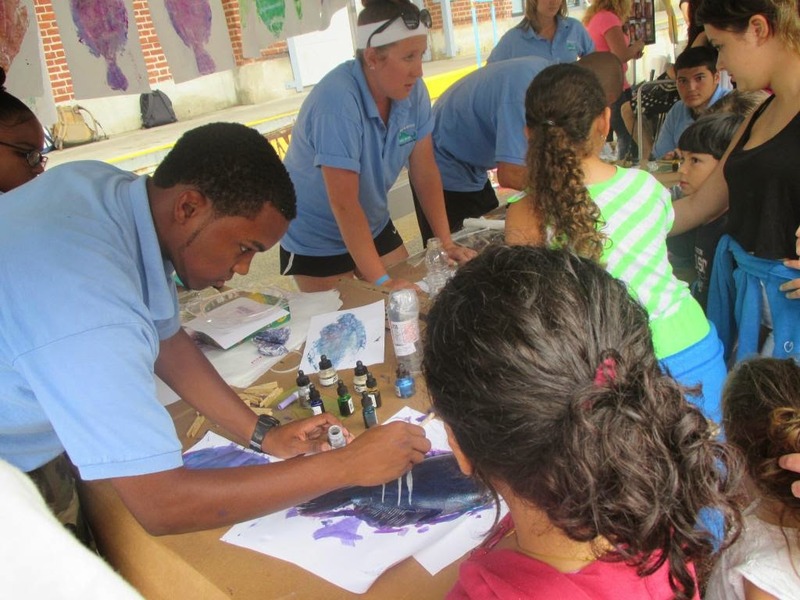 Senior Harbor Educator, Sam, and our Junior Program Assistants set-up a table to create fish prints. Sam showed us how to create a fish print. We used a few different types of fish including flounder. First, Sam cleaned the fish from any residue it had. Second, he put several drops of acrylic ink on the fish; he choose a base color and an accent. Third, he spread the ink over the fish to make sure it covered its head, gills, fins, and head. Then, he cut a piece of rice paper, and he placed the paper on the fish. We helped him pat down and smooth out any ink spots. When he lifted the paper, a wonderful fish print was created. After my shift ended, I was able to explore the festival which had music, art, and vendors. I even had a cup of chowder from No Name Seafood. It was a rainy yet rewarding day. Despite the unfortunate weather the Boston Seafood festival on the Historic Fish Pier was more than a success. 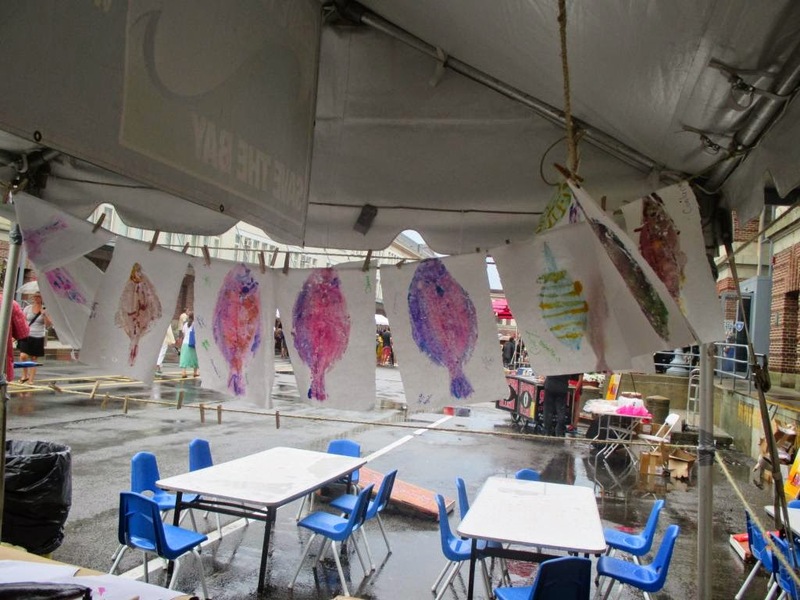 I helped run a tent where we offered the art of fish printing. 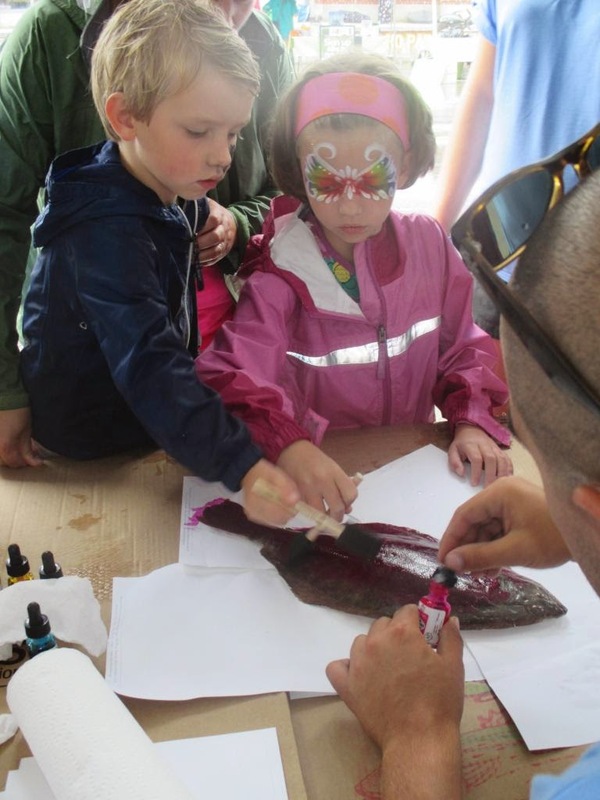 Sure, kids could have just colored or painted sea themed pictures, but fish printing is a rare art form not many get to experience! We were fortunate enough to get a donation from a local fish monger which included large whiting, summer and winter flounder, all beautiful fresh specimens! The printing started immediately. I set up color stations of ink which would compliment each other, and kids would pick what schema they wanted. Purples, pinks and reds seemed to be the most popular!! After the kids inked the fish with what ever design they chose, we would help them lay the rice paper and imprint the fish! Some kids got attached to their artwork which was funny to see, so we let them carry their piece away with them. Now that I have so many fish prints, I have the means to construct a mural! It will begin this week! In order to fish print, one must first have a fresh specimen, some cardboard, pins, rice paper and ink. The printer must first lay out the fish on the cardboard, using pinks to hold its fins in place. (requiring the artist to pin the fish to the cardboard.) Next a color scheme must be established for the fish. This requires mixing inks to find the best color and consistency. Once the artist is ready to ink the fish, they must pat it dry with paper towers to get rid of the fish's mucus membrane. Sometimes rubbing salt helps create a dry surface to work with. The Fish is now inked, with what ever color the artist chooses. Excess ink is patted off, to deter blotting. Rice paper is than laid over the fish and pressed firmly to the flesh. 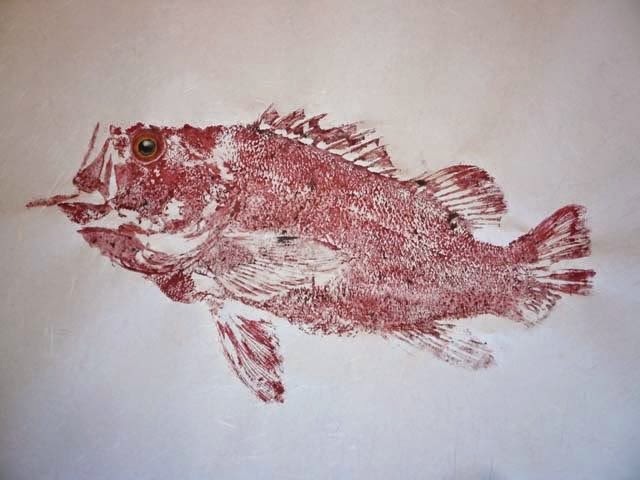 The artist then rubs the paper with his hand to create the rubbing affect fish printing achieves. When the artist has thoroughly applied pressure to capture detail, they must slowly lif the paper off the fish in order to reveal the image. Be careful to avoid pooling liquid ink, or fragile areas where the paper may tear apart. Once the paper has been removed from the fish it should be placed on the ground, anchored by weight, to dry off. Allow 20-30 minutes for the drying period as tacky ink will smudge and run. Stop by the Seafood Festival this Sunday if you have any interest in viewing the process and personally trying it!